Having recently been looking back at some old looks that I have created in the past, I've been tempted to start re-creating some of them now that I have better makeup and photographing skills! The first that look I decided to re-do is this graphic red winged eyeliner - a very simple concept, yet still very effective. And of course you can switch up the colour as you please. 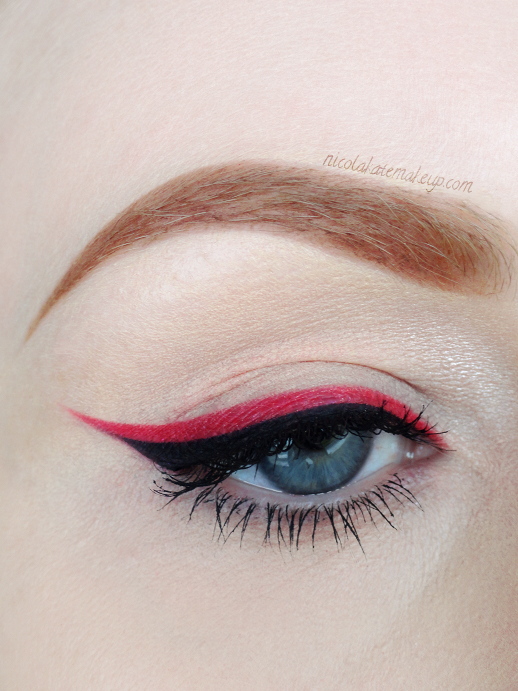 Truth be told, I didn't use a red liner at all. I simply used a red eyeshadow applied with a small angle brush to trace out the shape of the wing, and then used a clear liquid base mixed with the same eyeshadow to go over the top to intensify the colour and to also sharpen and clean up the edges. 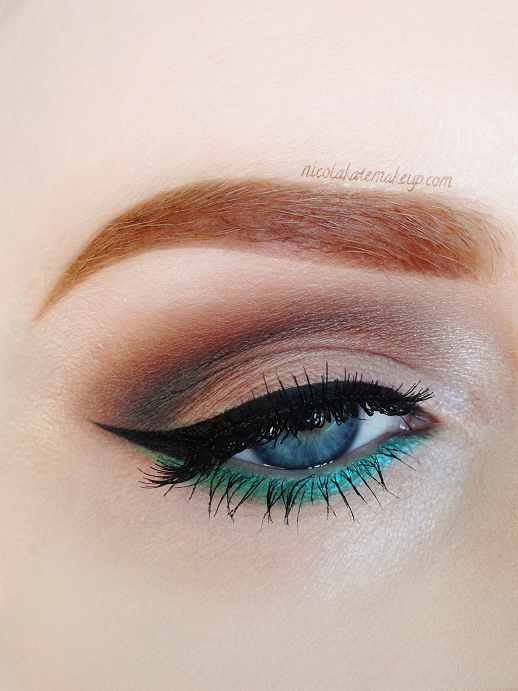 I then followed my usual routine of creating a smaller wing over the top with my black gel liner. I prefer this method to actually going out and hunting down unusual coloured eye liners as this way you can literally take your pick of any colour you want and create your own out of shadows that you have already paid for. 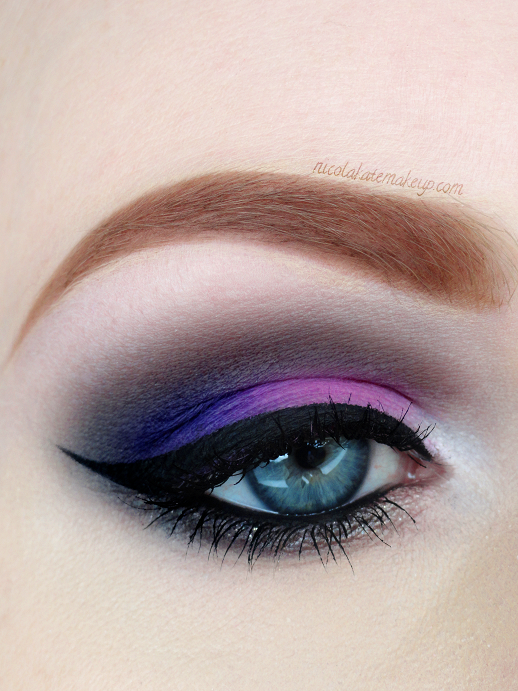 As I've been drawn to using purple and pink shadows more so than any other colour lately, and having it just been prom season in the US and proms just around the corner over here in the UK I was inspired to put together a feminine yet flirty eye. I decided to stick with typical girly colours but the use of a black eyeliner still adds edge to the look without making it appear too dramatic. I also used a white eye pencil along the lower waterline as opposed to black, within keeping of a softer appearance and of course to create the illusion of a larger, more wide awake eye. Being a big fan of Urban Decay, I was excited when I read that Kim Kardashian's personal MUA - Joyce Bonelli - had used their products to create some of Kim's signature smokey bronze looks in the past, so I decided to put together a Kim Kardashian inspired eye. I looked up what Joyce had used on Kim via her blog, got together what products I had and substituted those that I didn't. Kim usually sports long, wispie lashes, so I incorporated that into the look too. I used all my power and might to refrain myself from doing winged liner, and instead chose to press a little black liner right into the base of the lashes to give a more subtle effect and to make the base of the lashes appear fuller, much like Kim's, and I was very happy with how it turned out. The great thing about bronze and gold shades is they can look flattering on almost any eye colour and any skin tone, and they are definitely some of my favourites to use on a night on! My favourite place to find inspiration or colour combinations is - without a doubt - Instragram. I can guarantee that whenever I'm feeling super uninspired I will always find something beautiful on there that soon sets me back on my way to playing around with my makeup and trying out different looks. There are thousands of amazingly talented makeup artists to be found on there, and sometimes I just can't help but recreate some of the gorgeous looks that I come across. Below is a recreation of a look that I saw posted by the very beautiful and talented isastarmakeup. If you haven't already, I definitely recommend checking out the wonderful MUA's of Instagram. 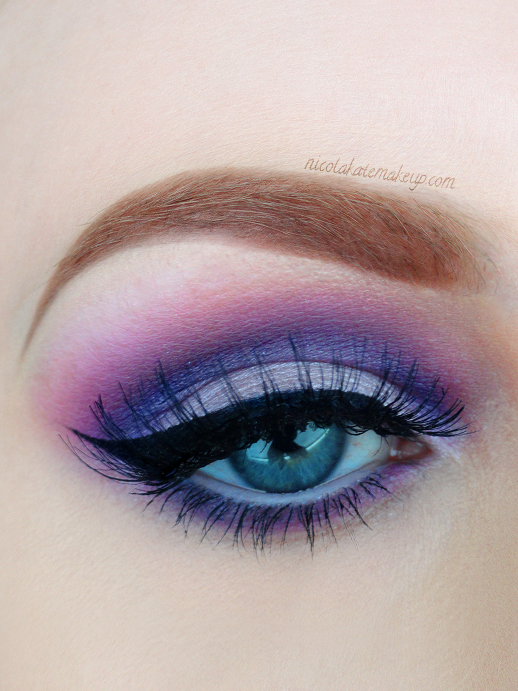 I loved this basic colour combination, and although using colours that are in the same shade range as your eye colour does little to make the most of them, the use of a pink toned purple rather than two blue toned shades more than compensated and helped to make my eye colour appear that little bit more vibrant. So I've had Urban Decay's 'Flipside' eyeshadow in my makeup bag for months and months now, and even though it's a stunning colour, I just haven't found a way to use it in a way that suits me and my eye colour. Green shades are undoubtedly more suited to brown eye's and up until today, no matter how often I attempted to use this colour in the past it always seemed 'off' on me. It took a lot of messing around and a lot of different styles to finally realise that this shade looks best on me in the most simplest of forms. 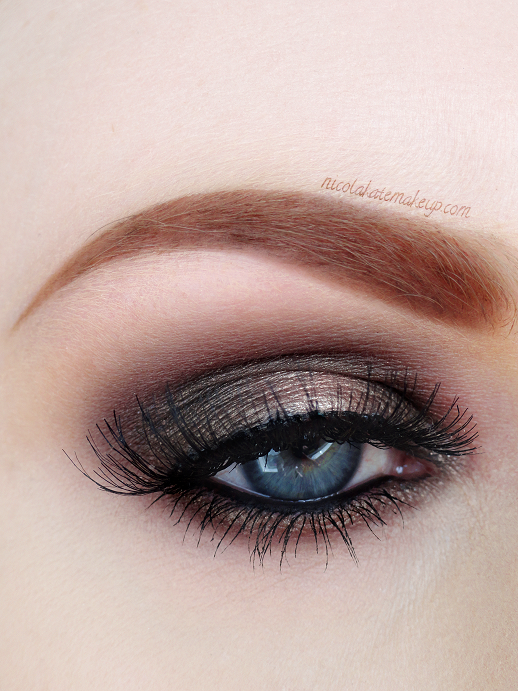 Rather than trying to make this shadow work as an all over lid colour, I decided to stick to basic matte neutral shades all over the lid and use Flipside along the bottom lash line for a pop of colour instead, and I was pleasantly surprised at how pretty it turned out.